MMRDA Recruitment 2018.Mumbai Metropolitan Region Development Authority has released a notification for the recruitment of Dy. & Chief Engineers vacancies.Check the eligiblity and notification prior to apply for the positions. Graduate degree holders from mechanical engineering can apply for Deputy engineer post. Applicants must have minimum one year experience. Degree holders from Civil/ Signaling and telecommunication can apply for Chief engineer post. Upper age limit for Dy. Engineer is 43 years, Chief engineer is 55 years. Through interview test contenders will be selected. 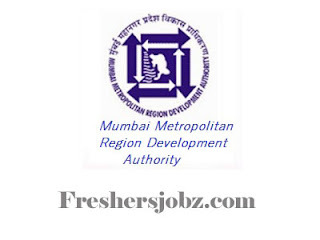 Mode of applying for MMRDA Recruitment is through online mode. 10th October 2018 is the last date to submit application forms.